It's been quite a long time since the last report was written. Well, we are pleased to be the first to obtain news from Intel on their announcenment a new strategy of redeploying the way to utilize past generation technology. Intel has been known of coming up with many unique ideas in terms of marketing and last minute moves to strengthen their market value against competitors. Looks like this time they have found an almost foolproof market where many competitors will be left in the dust. Not to give too much away but it does involve heat in terms of cooking. Who would have guess? Now on to the report. Today I was walking around London Drugs, a local store similar to a mini Wal-Mart. 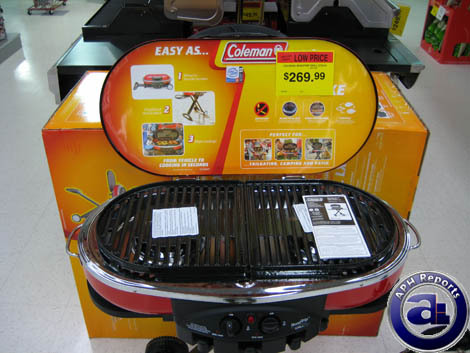 I was looking at the front display of a Coleman BBQ grill. 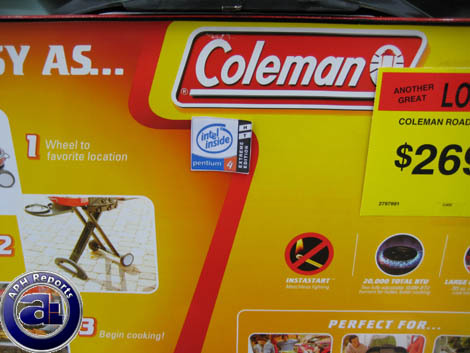 Not only did I notice the huge price tag advertising an overpriced Coleman grill but also something very familiar to users at APH. We have been known to call it the PresHott but in reality it is a Intel Pentium Prescott. I am fairly surprised that it would be put used in a barbeque. Most users are quick to denounce this grill but further inspection shows that not only does it run super hot and ineffectively, but it is in reality a Prescott 2M Extreme Edition running at 3733MHz. We may at first be surprised but then when you ponder it, you really do understand why they may do it. This thing was literally a space heater so why not use it as a grill starter. Can you imagine 2 propane burners and a P4 processor cooking your hot juicy meat? It will be literally smoked in a matter of minutes. This means that you get a lot of power in this Coleman grill. We see how technology has changed and how older technology is being used. This is actually officially a new way to get rid of old products we now get rid of to upgrade to the latest technology. Such as us dumping our old P4s to make way for the Core 2 Duos. This is how Intel now gets rid of their last generation technology. Be it putting it in refurbished computers, Asus Eee PCs or strategically locating it in new grills. Now on my way home I happened to walk into McDonalds to grab lunch. I bought myself a McChicken combo with a medium coke. This seems to have nothing to do with this report but it actually does, just be patient. Anyways as I sat down to eat I noticed I was given an empty cup and remembered I was told to fill it up myself over at the Soda dispensing machine. When I once again saw the same logo as before. The easily recognizable PresHott logo. Now I wondered what the Soda tasted like and was once again reminded of the barbeque. Just to be safe I let the person in front of me dispense his drink first. It looked like it was dispensing properly and had no troubles so I decided it was safe. Unfortunately this was not the case since he had dispensed ice from the ice machine just right beside it. It was fairly obvious something is wrong when the ice machine spews out boiling hot water in your cup. To say I was surprised would be an overstatement. I totally saw it coming but I chose to ignore it. I ignored this and just went on to eat my sandwich. 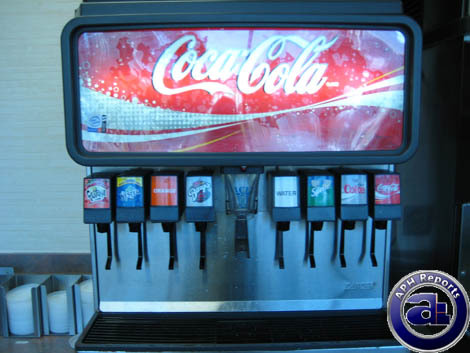 Now as I was eating I pondered this, if this machine produced boiling water instead of ice, what would the soda be like. Now after I finish eating I approach the machine again and fill it up with Coke. To no surprise at all came Coke that looked normal except once again there was steam emitting from the device. 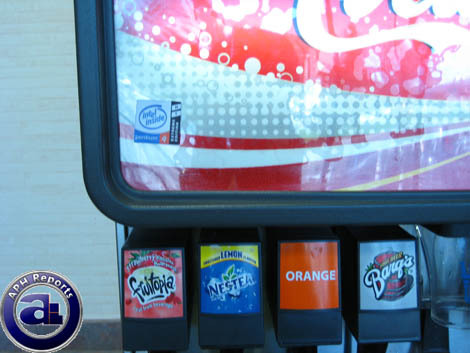 Later I would ask the staff up front what was wrong with it only to get them to tell me it was the "Hot Soda Machine". I guess I am just getting old and maybe I just don't understand the new fads these days but come on Hot Soda? There is definitely something wrong with this picture. I see how the Extreme Edition can be applied to both of these uses. It really is Extreme to have PresHott cooked meat with a nice boiling cup of soda to go with it. I guess Intel did manage to get rid of their last generation processors by dumping it on commercial business starting from Colemans to McDonalds and even maybe one day we may see it in a Xerox printer. Imagine a Xerox printer melting the ink and the paper into a work of art. But till that day comes I will stick with my latest generation technology and have a nice juicy steak on a propane only grill with a cold soda to drink.